I know I know, it's been so long. I'm very busy and important. Here is an update in photos! This isn't even this biggest one we've had skitter across the floor. We had one dash across the wall that I thought was a mouse. We liberate all of them, except the mouse one, he got vaccuumed because we didn't want him nesting in the cables behind the TV. And he had already snuck back there before we had the cup ready. This is the beetle that jumped off the roof in the spring. We framed him. Last weekend we were in Victoria and we spent a night up at the lake. We sneak up there every chance we get because it's so lovely. This is what we woke up to on Sunday morning. I want to wake up to that every day. Oh yeah! And in other news, check out the top! I'm going to make one with a big cowl neck and longer sleeves in fleece. The best part of that first picture is that it's only got one sleeve at that point! I love it! Now I must dash, the Men are hungry! I am pretty determined to finished that top today. I was having (still having) a hard time figuring out the instructions. As far as I can tell, they want me to sew the back seam of the facing to the back seam of the back of the top and THEN turn it inside out so I can finish it. This makes no sense to me because the back seam will be all twisted up and upside down. As far as I can tell. So I am thinking... screw it! I am going to sew up the back and skip the tie at the neckline (I don't really want that anyway) and go from there. We shall see how it works. And if all else fails I can wait until Angie shows up and I can ask her what the hell is going on. But it's so cute and I want to wear it now. Even though it's ripping hot outside at the moment. I know! It's been wacky weather central this summer. Actually now that I think of it, I might wait for Angie after all. She'll be here in two days. That's not so bad. And then at least it will be done properly! Today then I will continue to set stones. I've got 8 more of these bad boys ready to set. 5 with peridots and 3 more with amethysts. They are mini medallions that will have sharp gold bails to match the gold settings (gold currently on order) I am thinking of scratching up the surface treatments a bit more too. I want more of a matte finish for these guys. And this weekend I am going in search of precious, faceted beads for some Simple Pendants. So cute. My body is a constantly evolving canvas. I've got one more planned and then I will be finished. I've got water on my arm, wind on my back, fire in my belly and the last one will ground me. I busted out the new sewing machine today. I've been so excited to start sewing. I am even thinking about making my winter coat this year, I know! I've got the pattern now and everything. I believe I mentioned it before, but I'm mentioning it again. Excited. I picked up some lovely chocolate brown cordouroy from the fabric place just up Fraser. It's such a funny little place with all sorts of old school fabrics and notions from days of yore. But that's what I am going for. Perfect yes?? You can sort of see the top coming together. I nearly cried at one point! I don't know if you are familiar with pattern instructions, but they are bizarre and don't REALLY make sense. So now I am finished for today and will pick it up again with a fresh perspective. Plus my back hurts from scrunching up under the machine all day. But it's so nice. She doesn't have a name yet, I don't want to rush it. 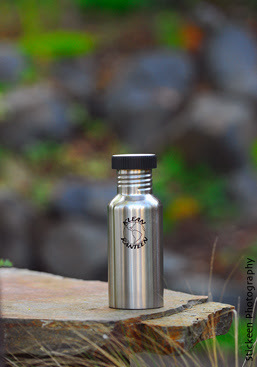 Finally I tracked down a steel non leaching water bottle. It's small enough not to weigh me down, but big enough that I was drinking from it all morning and there is still some left. Off into the studio I go, back to work! Oh lordy. I told you we were going to accost Ikea in an inappropriate way today and we certainly tried. Although I think that Ikea actually did a number on us instead. We took a couple of wrong turns on the way there, and thank goodness we were all levelheaded about the whole thing. There were a couple of dicey moments, but in the end we got in and out in one piece. However I will say this... I will NEVER go to Ikea on the last long weekend before school starts EVER again. Otherwise it's a lovely good time! The food at the Coquitlam location is actually really good. Kristy got a quiche that was quite delicious, and I had me a slice of a gluten free hazelnut toffee sweet. Gluten free!! If Geoff and I weren't trying to not eat sweets I would have brought home a whole pie. This is how we found ourselves after an hour or so. Mom actually came through with flying colours out of the whole business. She was keen and raring to go for more. If Kristy and I could have handled it. I think Kristy said something about the Aquarium. Okay, so I know that it is September now (what the??) and it's starting to cool off a little bit. But I am not loving it I have to say. I usually LOOOVE the fall, it is my favorite... back to school, amazing cool evenings, brisk mornings and the reintroduction of soups, pies and pastry in general back into my diet. Everything is better in a pie crust. But we haven't had summer yet!! Two weeks (in total, not even at the same time, thanks a lot global warming) of hot weather does not a summer make. I am going to make the most of it and just deal with it like an adult. This is the last complaint you will here from me. Moms and the sister are hanging out with me tomorrow. We are going to accost Ikea in a totally inappropriate way. Oh god Ikea, why do we love you so much? Is it that you send us catologues to tease us in the mail? Is it your cheapy hilarious goods? Or is it that we can wander around for an ENTIRE afternoon and come out feeling like we are going to redo our entire lives in minimalist, Nordic, crackers and cheese eating chic? I'm not sure why crackers and cheese comes into it, but dang it it does. For whatever reason I want to sit down and eat crackers and cheese after hanging out there. Just like I crave tea and scones when I watch anything Jane Austen. Or meat and beer and vegetables when I watch Lord of the Rings.